Week 2 of excavation began with a visit from Ryan Road Elementary School’s third graders. With their help, we continued digging three units in the back yard. Although it’s hard to dig through roots, the students learned how plants and animals can disturb archaeological deposits as roots and rodents push their way through the soil. It’s always tempting to keep our eyes on the artifacts we see in the dirt, like ceramics or even rocks and bricks, but we look forward to finding out if those objects are a part of larger features (non-movable artifacts) buried further in the ground. All of the students also got a chance to help process the artifacts we have found over the past week. In the afternoon, we were joined by several excellent volunteers who helped with lab processing, screening and excavation in several different areas of the yard. One of the most interesting things we’ve discovered over the past week is the large amount of large animal bones, especially cow, pig, goat and sheep. Most of these suggest what would have been eaten by the residents of this house over the past three centuries, like soups and stews rather than steaks and pork chops. Today, Jill found a cow tooth that a root had grown through. Sounds like a serious root canal! One of our student visitors, Elena, drew a great picture of our archaeological units and what really happens in the field! 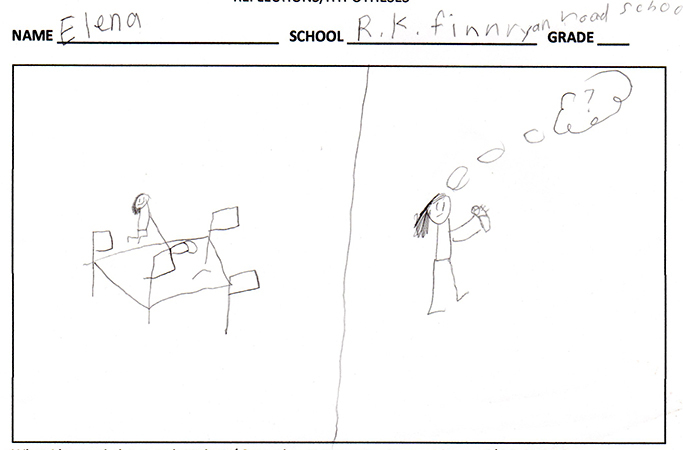 Another student visitor, Emily, reflects on her experience. 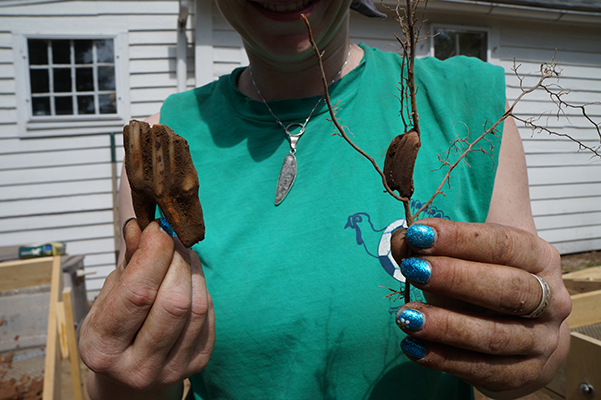 Our interesting find of the day was a cow tooth (on right) with a root growing through it!